The International Workers' Association (IWA; Spanish: AIT – Asociación Internacional de los Trabajadores, German: IAA-Internationale ArbeiterInnen Assoziation) is an international federation of anarcho-syndicalist labor unions and initiatives. Based on the principles of revolutionary unionism, the international aims to create unions capable of fighting for the economic and political interests of the working class and eventually, to directly abolish capitalism and the state through "the establishment of economic communities and administrative organs run by the workers." As a result, by the end of World War II all but one of the International's branches had ceased to function as unions, a slump which continued throughout the 1940s and 1950s. It would not be until the late 1970s, with the death of Spanish caudillo Francisco Franco, that it would see a major union, the Confederación Nacional del Trabajo (CNT) reform within its ranks. After the 1970s, the International expanded and currently counts 11 member sections and 6 Friends. This federation is designed to both contest immediate industrial relations issues such as pay, working conditions and labor law, and pursue the reorganization of society into a global system of economic communes and administrative groups based within a system of federated free councils at local, regional, national and global levels. This reorganization would form the underlying structure of a self-managed society based on pre-planning and mutual aid—the establishment of anarchist communism. The IWA rejects all political and national frontiers; it calls for radical changes to the means of production to lessen humanity's environmental impact. While regarding industrial acts such as strikes, boycotts, etc. as the primary means of struggle against what the IWA viewed as capitalist and state exploitation, the founding document of the IWA also states that syndicalists recognize "as valid that violence that may be used as a means of defense against the violent methods used by the ruling classes during the struggles that lead up to the revolutionary populace expropriating the lands and means of production." After the end of the war however, with the workers' movement resurgent following the October Revolution and subsequent Russian Civil War, what was to become the modern IWA was formed, billing itself as the "true heir" of the original international. The success of the Bolsheviks in Russia in 1918 resulted in a wave of syndicalist successes worldwide, including the struggle of the Industrial Workers of the World (IWW) in the USA alongside the creation of mass anarchist unions across Latin America and huge syndicalist-led strikes in Germany, Portugal, Spain, Italy and France, where it was noted that "neutral (economic, but not political) syndicalism had been swept away." Skepticism was initially expressed by Germany's influential Free Workers' Union of Germany (FAUD) towards the Bolsheviks' concept of an international of trade unions, known as the Profintern. Such sentiments grew significantly as delegates from several countries gained access to Bolshevik Russia. Augustine Souchy of FAUD scathingly critiqued the failings of "dictatorial state socialism," as concerns rose over proposals from the Bolsheviks that all unions should submit themselves to the Communist Party's leadership and reports began to arrive documenting the imprisonment of anarchists and socialists by the Bolsheviks. Many of the largest members of the IWA were broken, driven underground or wiped out in the 1920s-30s as powers hostile to them came to power in states across Europe and workers switched away from anarchism towards the seeming success of the Bolshevik model of socialism. Germany's FAUD struggled throughout the late 1920s and early 30s as the brownshirts took control of the streets. Its last national congress in Erfurt in March 1932 saw the union attempt to form an underground bureau to combat Hitler's national socialists, a measure which was never put into practice as mass arrests decimated the conspirators' ranks. The editor of FAUD organ Der Syndikalist, Gerhard Wartenberg, was later killed in Sachsenhausen concentration camp while Karl Windhoff, delegate to the IWA Madrid congress of 1931, was driven out of his mind and also died in a death camp. There were also mass trials of FAUD members held in Wuppertal and Rhenanie, many of those convicted never survived the death camps. Italian IWA union the USI, which had claimed a membership of up to 600,000 people in 1922, was warning even at that time of murders and repression from Benito Mussolini's blackshirts. It had been driven underground by 1924 and although it was still able to lead significant strikes by miners, metalworkers and marble workers, Mussolini's ascent to power in 1925 sealed its fate. By 1927 its leading activists had been arrested or exiled. Portugal's CGT was driven underground after an unsuccessful attempt to break the newly installed President of Portugal, Gomes da Costa, with a general strike in 1927 which led to nearly 100 deaths. It survived underground with 15-20,000 members until January 1934, when it called a general revolutionary strike against plans to replace trade unions with corporations, which failed. It was able to continue in a much reduced state until World War II but was effectively finished as a fighting union. Massive government repression repeated such defeats around the world, as anarcho-syndicalist unions were destroyed in Peru, Brazil, Columbia, Japan, Cuba, Bulgaria, Paraguay and Bolivia. By the end of the 1930s legal anarcho-syndicalist trade unions existed only in Chile, Bolivia, Sweden and Uruguay. 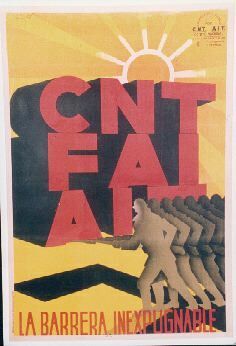 But perhaps the greatest blow was struck in the Spanish Civil War which saw the CNT, then claiming a membership of 1.58 million, driven underground with the defeat of the Spanish Second Republic by the Nationalists. The sixth IWA congress took place in 1936, shortly after the Spanish Revolution had begun, but was unable to provide serious material support for the section. The IWA held its last pre-war congress in Paris in 1938, with months to go before the start of the Second World War it received an application from ZZZ, a syndicalist union in the country claiming up to 130,000 workers – ZZZ members went on to form a core part of the resistance against the Nazis, and participated in the Warsaw uprising. But the international was not to meet again until after World War II had finished, in 1951. During the war, only one member of the IWA was able to continue to function as a revolutionary union, the SAC in Sweden. After Hitler’s defeat, much of the Spanish CNT's active membership, now operating informally in Francoist Spain, remained split with some in exile in France and Britain, the rest driven underground. In Sweden, the SAC retained a presence while in every other country previously active members of the International had to start over. For most of the next two decades, the international struggled to rebuild itself. The IWA’s 1980 congress showed much improvement, reaching ten sections and benefiting from the reorganization of the CNT, which was able to send delegates from Spain (as opposed to exiles) for the first time since the 1930s. Reformed sections in Italy (USI) and Norway (NSF), along with others from the UK (Direct Action Movement), USA (Workers Solidarity Alliance), Germany (Free Workers' Union, FAU) and Australia Anarcho-Syndicalist Federation, were among those who joined. Shortly after their arrest, an open letter was circulated by Serbian academics criticizing the charges and the attitude of Serbian police. The six were formally indicted on December 7 and after a lengthy trial procedure Trivunac, along with 5 other anarchists, was freed on February 17, 2010. On 10 December 2009, the management of the Babylon cinema in Berlin tried to ban the Free Workers' Union (FAU) from calling itself a union. Despite this, after the XXV Congress, members of FAU decided to develop another direction and push for a new international network. Following decisions made at the CNT Spain Congress and the USI Congress to join this direction and to suspend dues in the IWA, those organizations were disaffiliated at the XXVI Congress in 2016. Part of the CNT wished to remain affiliated to the IWA. In 2018,the former IWA members met with other groups in Parma, Italy, to establish a new international organization, the International Confederation of Labor (Confederación Internacional del Trabajo). In June 2016, the first meeting was held in Spain concerning the reconstruction of the Spanish section of the IWA. A subsequent Congress was held in Benissa in November 2016 and Villalonga in April 2017 to reconstruct the CNT-IWA. The issue of the reintegration of the reconstructed Spanish section was on the agenda of an Extraordinary Congress of the IWA in 2017, where the Section in Spain was recognized as the continuation of the CNT-IWA. The following organizations are either Sections or Friends of the IWA. Friends of the IWA are regarded as fellow travelers politically but have not formally joined and do not have voting rights at Congress. They are entitled to send observers to Congress. ^ a b c "The Statutes of Revolutionary Unionism (IWA)". IWA. Retrieved 2013-10-13. ^ "Going Global - International Organisation, 1872-1922" (PDF). Selfed. 2001. Retrieved 2009-09-29. ^ Daniel Guerin, Anarchism: From Theory to Practice (New York: Monthly Review Press, 1970), pp.25-26. ^ "1860-today: The International Workers Association". Libcom.org. 2006. Retrieved 2009-09-29. ^ Rocker, Rudolf (2014). Anarchism and Anarcho-Syndicalism. Freedom Press. ^ "The IWW, the state, and international affiliations". libcom.org. Retrieved 2016-12-16. ^ "Estudios Interdisciplinarios de América Latina y el Caribe". www.tau.ac.il. Retrieved 31 October 2017. ^ "Organise Magazine issue 65". Anarchist Federation. 2005. Archived from the original on 2008-12-01. Retrieved 2009-09-29. ^ a b "Global anarcho-syndicalism 1939-99" (PDF). Selfed. 2001. Retrieved 2009-09-29. ^ "ASF-IWA – Anarcho-Syndicalist Federation". www.asf-iwa.org.au. Retrieved 31 October 2017. ^ SPIP, Design: Wolfgang (www.1-2-3-4.info) / Modified: Matthieu Marcillaud pour CMS. "CNT AIT TOULOUSE ANARCHOSYNDICALISME !". CNT AIT TOULOUSE ANARCHOSYNDICALISME !. Retrieved 31 October 2017. ^ "Belgrade: Professors Send Open Letter in Defense of Arrested". Archived from the original on 2013-10-14. Retrieved 2014-04-15. ^ a b "Report of IWA`s XXV Congress in Valencia- December 6, 7 and 8 - 2013 - International Workers Association". www.iwa-ait.org. Retrieved 31 October 2017. ^ Secretariat (2016-12-05). "Statement of the XXVI Congress". International Workers' Association. Archived from the original on 2016-12-07. Retrieved 2016-12-07. ^ "Statement of the XXVI Congress - International Workers Association". iwa-ait.org. Retrieved 31 October 2017. ^ "Announcement from the national conference of syndicates for the restructuring of the CNT/AIT +castellano". 3 September 2016. Retrieved 31 October 2017. ^ The Belgrade Congress // iwa-ait.org, 11/12/2017.